This is a tough one for me, especially as spring is finally arriving in DC. There are so many outdoor activities that I love, but I can’t do them because of… well, y’know. But I’m happy to say what I love to do in the out-of-doors, if only to remind myself why I’m doing all of the tough-as-nails physical therapy, pain and all. Ride my bicycle. This should be obvious: I love to ride my bike, and can’t really stand indoor riding. That said, this summer will be full of such activity. Ski. My first sporting love, and I’ll be back on those slopes this coming November. Camp. 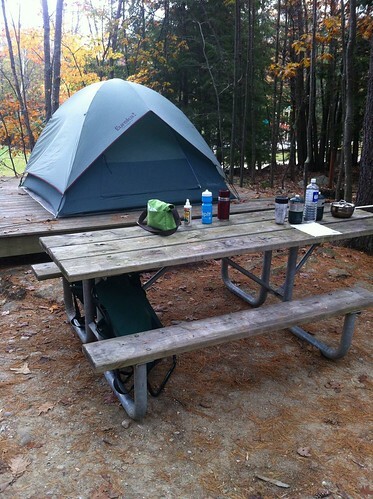 sprite and I really enjoyed camping in New Hampshire last fall, and I always like to sleep outdoors – it re-centers me. Picnic. 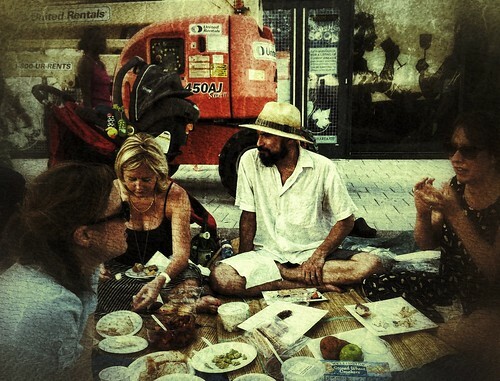 My favorite Friday night activity is to gather with friends for a picnic at The Yards Park. Go to concerts. I love going to shows at outdoor venues, like Merriweather Post Pavilion or Wolf Trap. Read. 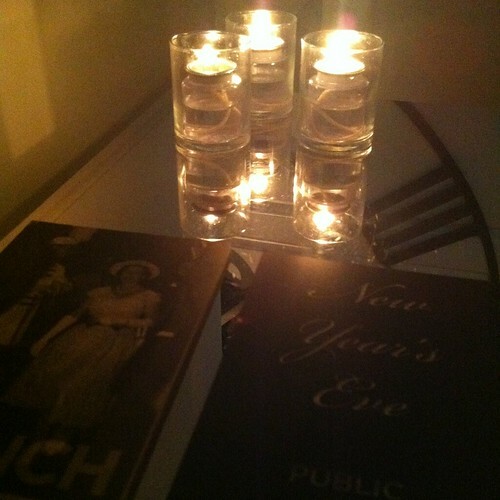 Most progress I make in books is done at parks and cafÃ©s. Eat at cafÃ©s. DC has many wonderful cafÃ©s with outdoor seating. Go to the beach. And it has to be a real beach – i.e. one with ocean water and real waves for body surfing (which I won’t be able to do ’til mid-August due to my anticoagulant meds). Still: sun, surf, sand, I love it! Drink. A cold beer, a glass of wine or sangria, an icy daiquiri or margarita – all are wonderful and perfect for outdoor imbibing. Hike. I love hiking, and don’t do it often enough. And it’s something I will be able to do this summer, once the leg is strong again. Do you have favorite things to do outdoors? Share ’em in the comments! I tweet. Really – I do! And I’ve met a lot of great people – many of whom are now friends – via Twitter. I’ve saved money via “tweet-only” special sales. Breaking news is almost always found first on Twitter. 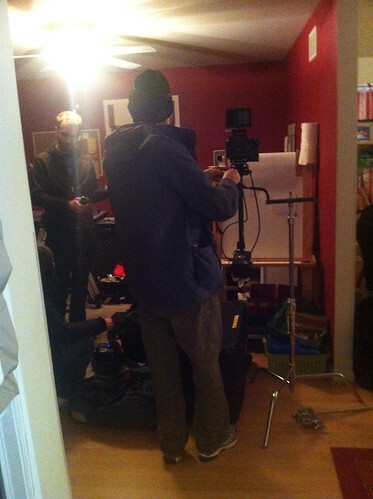 And this past November, Twitter afforded me a once-in-a-lifetime opportunity: to film a commercial for Dunkin Donuts. I thought it would be an offer for a discount coupon, given the sheer number of times I’d “checked in” at DD on road trips. Yes, it’s a tweet that I posted 2.5 years earlier, but it caught the eye of Dunkin’s corporate HQ. They wanted to talk with me about “a project” they were working on, specifically with Dunkin fans. I figured it was worth a go, and I sent them my contact info. contacted by Dunkin’s PR department. contacted by their ad agency, Hill Holliday. contacted by ACNE Productions, who would film the ad. contacted by a wardrobe consultant about my measurements. booked on a flight to Chicago. 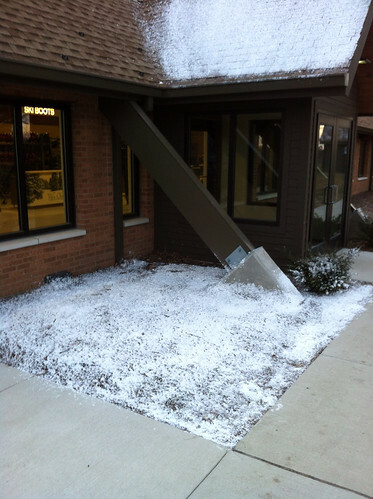 Yes, Chicago – not exactly ski country. But the commercial called for me to be in skiing mode, so I brought my full ski kit with me: skis, boots, poles, helmet, goggles, gloves, pants, jacket, base layers, you name it. For an overnight trip, it was a bit much. So, all packed up, I left Washington National Airport after work on Wednesday, December 4th, arriving late in Chicago, where I caught a taxi to The Public hotel in the Gold Coast section of town. It is a gorgeous art deco hotel that has been lovingly renovated without losing any of its vintage charm. Granted, I didn’t spend a long time in the hotel, as we – the film crew, the account manager, and me – had to depart our comfy digs at 4:00am to drive out to Lockport, one of Chicago’s exurbs, for our first bit of filming. During the drive, I marveled at the call sheet for the day. This single sheet of paper listed every single person involved in the creation of a 30-second advert. Almost 70 people and organizations were listed on the call sheet – a staggering number, but they all had specific roles. Some directed, others filmed, others did lights and audio, still others provided our meals. And I was just one little cog in this machine. We arrived in Lockport at 5:10am, at the house of another Dunkin social media advert star, Elizabeth. She already shot a lot of footage in New Jersey back in the summer, but the ad agency wanted to film some setup footage at her house. Her tweet is featured in the ad, as are her really wonderful kids, who were given free reign to destroy their own living room for the sake of coffee! Click here to see Elizabeth’s ad. Upon our arrival, craft services had a HUGE breakfast spread waiting for us in the basement of Elizabeth’s house. The whole crew for the day convened here, and introductions occurred over coffee, eggs, bacon, oatmeal, and fruit – all very tasty and very filling. The whole day was produced under the auspices of SAG-AFTRA, which meant that strict union rules about shooting times were followed. So spot-on 7:00am, film rolled on Elizabeth’s ad, while I was whisked away to hair and makeup. My brightly colored ski duds were exchanged for more earthy tones: light brown parka, navy fleece top, orange down vest, grey pants, black boots, and a multi-colored hat. This wasn’t the only option, but it’s the one that suited the fancy of Tyler, our director. All of the clothing was “de-branded,” with corporate logos removed as well as possible. Only my personal gloves and helmet were used as wardrobe, with the logos either taped over or obscured with clever angles. Likewise, while I was in the house getting into “TV shape,” my ski equipment was also “de-branded,” with multiple hues of duct and gaffer’s tape used to obscure as many logos as possible. In between takes of Elizabeth’s commercial, I recorded voice-overs in a corner of the now-partially-destroyed living room. I used my own words, with a few key things included – namely, a mention of Dunkin Iced Coffee. Wait – iced coffee? In winter? Yes, this was the focus of the ad. Personally, I only drink hot coffee in the winter months, but I was willing to suspend my own druthers for this commercial – no problemo. Once my voiceovers were done, I retreated to my trailer out on the street. I was ready to film, and didn’t know quite what to expect. I’d gone in with no preconceived notions of what would happen – a plus, I think. My filming started around 9:30am at a house three doors down from Elizabeth’s. There was a rented car that I would drive, with a ski rack on its roof. My ski equipment was placed in the garage, and the director had me take the equipment from the garage to the car. I did this move 5 or 6 times, each from different angles. I managed to scratch the car on the second take (oops), but otherwise, the filming went fine. I was then filmed pulling out of the driveway a few times. Filming then moved to a Dunkin Donuts store in Orland Park, IL, which delighted the teenage employees to no end. They were read the riot act regarding social media (i.e. don’t post pictures from this shoot on Facebook or Twitter), but they were all quite pleased to have a national TV ad being filmed at their store. This is where I got my iced coffee, which was really room temperature coffee (prepared to my usual level of cream and sugar) with acrylic ice cubes in the cup. It was cold outside, so an ice-cold drink wasn’t really what I wanted at the time. We filmed 10-or-so takes of me leaving the store, walking out to my car, and so forth. It went smoothly, and I listened to the directions from Tyler and his crew to help improve each take. After our shooting was complete, we ate lunch (tasty chicken, salmon, and other great things) in the back room of the Dunkin store, where the donuts would be baked. After lunch, I went in for one last touch-up of hair and makeup, as my trailer wasn’t going to the final shooting location. After leaving Dunkin, we drove on some country roads to give the impression of me driving to a bucolic ski mountain. I felt like I was on Top Gear in some respects, with a camera car doing its thing while I drove. The final filming location was a ski area outside of Schaumberg, IL, a 45 minute drive from the Orland Park area on the outermost beltway around Chicagoland. During this drive, I chatted with the cinematographer, who has filmed so many cool events and places. After driving around 40 miles on toll roads (in a car that, I might add, was still running its “Hollywood dummy” license plate – oops), we arrived at Villa Olivia Country Club and Ski Area. This is not the kind of ski area that anybody who really loves skiing would go by choice. 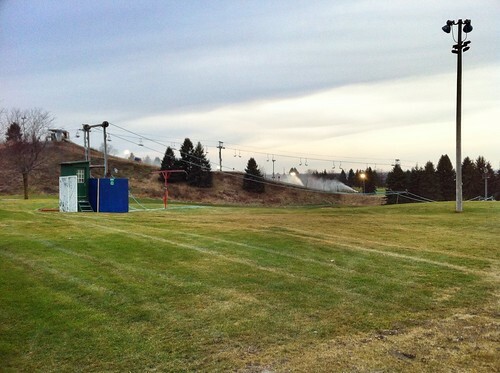 My guess is that the place is reclaimed landfill, where the ski slope had vertical drop added by mounding the landfill. Also, note the lack of snow in this picture. Y’see, the week leading into my commercial shoot was very warm, so any snow that had been made to shoot the commercial had melted to the point where it wasn’t usable. Sure, it was cold on the day of shooting, but this place didn’t have the capability to make a skiable ribbon of show in our short window for shooting. Fear not! ACNE had a plan: they would make “Hollywood snow” using cotton batting and spray foam to coat the lawn and sills of the ski lodge. It wasn’t perfect, but as it would only appear in the background of the shot, it wasn’t a huge deal. And we had some “snowflakes” flying in the air, as well. These were created using dish soap suds blown by a powerful fan. The soap tasted nasty (I managed to get a few gobs of foam in my mouth), but it was convincing enough on camera. We had to wrap shooting by 4:30pm, both due to SAG-AFTRA rules and the rapidly setting sun. The crew let out a big exhale, and everybody thanked each other for a hard day’s work well done. I managed to spy some initial edits taking place on a MacBook Pro in the ski lodge, which was very cool. The entire commercial was shot on compact, high-resolution digital cameras, so hard drives were sent via courier to editing studios. One of these couriers shuttled me back to downtown for a quick shower at The Public, after which I high-tailed it to O’Hare to catch my flight back to DC. 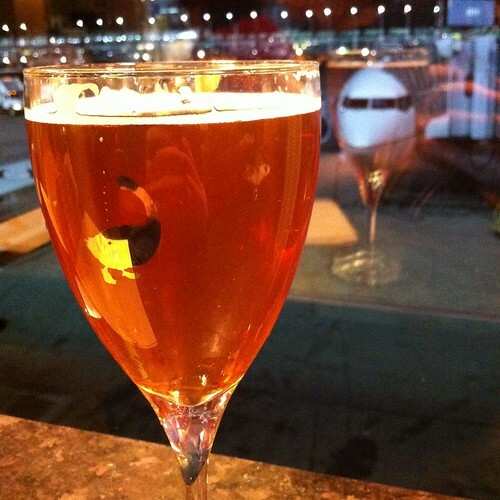 At the airport, I enjoyed a most welcome beer as I decompressed. I was back at work on Friday, having taken just Thursday as a non-specific personal day off. The next questions were: who do I tell that I’ve done this, and when will the ad air on TV? I decided to tell only a few people. Other than sprite, only 4 others knew of my adventure. I tried to stay mum on social media during the trip, using a “#blackops” hashtag on any tweets, Facebook posts, or FourSquare check-ins. The ad first aired in the New England area during the pre-game show for the Super Bowl. I know this because Sam called me after it first aired, asking how he didn’t know about this, how did I get into this ad, and so forth. At the time, I was at National Rehabilitation Hospital, still recovering from the #projectfemur surgery, and I hadn’t yet seen any edit of the ad. Sam sent me a quickly-recorded video of the first airing, and I laughed a bit. Mostly, though, the ad aired during prime-time coverage of the 2014 Winter Olympics. It aired twice per broadcast, every night of the games. Many more friends saw the ad, after which they would email, call, or tweet me that they had seen it and were shocked. That was my goal in not telling: surprise, pure and simple. Well, here it is! This is the 30-second version that didn’t air on TV. The 15-second version is just a shorter version, with only the voiceover of me reading the tweet. Dunkin’ Donuts “Rudi’s #mydunkin Iced Coffee Story” from Danny Rodriguez on Vimeo. Did I enjoy this experience? Oh yes. Would I do it again? You bet! So it goes to show that social media can connect people in rather sweet ways. P.S. – for the curious, my typical Dunkin coffee is a medium or large Dunkin Turbo (i.e. red eye) hot, with a little cream and sugar. And yes, I still get hot coffee in the summertime. Last Saturday, I was skiing at Liberty Mountain, Pennsylvania, coaching their alpine race team. The weather had been foggy and rainy all day, a once hard-as-rock snow surface turned into a slushy, peeling mess. On our penultimate run of the day, the kids, my fellow coach, Tyler, and I were taking a run on Lower Ultra, making giant slalom turns. The snow, by this point (12:40pm), was really soupy. About 3/4 way down the run, I caught the edge of my right ski in the snow. I was going approximately 40 miles per hour, and was now hurtling, with little control, toward a stand of trees and rocks. My instinct was to avoid hitting the tree, so I tried to self-arrest, stopping myself before going off the trail and into the woods. I tumbled and tried to stop. My left ski released. My right ski planted itself perpendicular to the fall line, sank into the snow, and stuck, while my body kept rotating counter-clockwise. The ski didn’t release. Something snapped. I tumbled one more time, and my right leg whipped around and landed in an awkward way, rotated out of a normal position. I didn’t move, not wanting to injure myself further. Adrenaline masked the pain. Two lift attendants saw the crash and called the ski patrol. Patrol arrived within 5 minutes, as did some of my fellow coaches. I was put on a backboard, my right leg rotated 45 degrees outward from its normal position. Had I dislocated my hip? Had I broken my hip or leg? This would not be known until I could get to a hospital. The ski patrol loaded me on the backboard onto a sled and took me to the resort base, where I was transferred to an ambulance (the EMT with the ambulance recognized me from the Civil War Century – the ambulance was based in Fairfield, PA). Having had no pain medication, this really hurt, but I pushed through the pain. 30-or-so minutes later, we arrived at Gettysburg Hospital, where I was whisked into an exam room. I was given an IV drip of pain meds, which helped blunt the searing pain. I was given X-rays, which showed a dislocated (i.e. spiral) fracture of my right femur, a couple inches below the femoral head, and other damage that may have been pelvis fractures. Given I was skiing so fast at the time of the fall, the orthopedist at Gettysburg wanted me to be transferred to a level one trauma center for my next steps. So I was given another ambulance ride, this time to George Washington University Hospital. Ativan helped me sleep through the whole ride (save for the last two miles, where I helped the drivers find the hospital). New X-rays determined that only my femur was broken (very good news), and a CT scan showed no internal injuries. Early Sunday morning, I had surgery to repair my femur: four pins and a rod are my latest additions. Four hours of surgery produced a repaired, but very sore and tired, me. Since then, I’ve been working to heal. It’s not easy. I can’t currently bear weight on the repaired leg. My upper body strength isn’t great, so standing up and using a walker is very difficult. But I’m carrying on. I’ll be transferred to an outpatient physical therapy facility in the next day or two, where I’ll likely spend two weeks. I hope to be back on my bike by late spring, and skiing again next winter.